Weight is important. We are always watching our weight, trying to stay healthy, maintaining our personal weight within a certain range. A cars weight is important, and how the weight is spread over the four tires affects its handling. 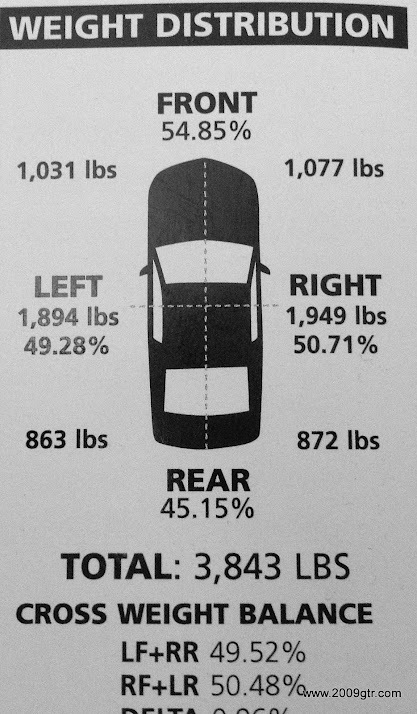 One forum member has his 2009 Nissan GT-R down to 3587 lbs without driver. This is w/o any CF body parts & nothing removed (other than rear seats ~10lbs, and rollbar), steel-bodies coilovers (not aluminum) etc., low fuel load. DSPORT Magazine put a 2012 Nissan GT-R Premium on a set of scales. 3843 lbs. No mention on exactly how much fuel this car had in it, but it can make a pretty big difference. Gasoline weighs 6.073 lbs per gallon. The stated capacity of the GT-R is 19.5 gallons or about 118 lbs of fuel. DSPORT put their GT-R on a diet for the 2011 SEMA show, and took 213 lbs out of the car. The articles are going to be part of an upcoming group of articles. For 2013 the Premium GT-R is listed as 3829 lbs with a 53%/ 47% weight distribution. This would be dry of fuel, and possibly all fluids. The Black Edition in 2013 with the carbon fiber wing element, and Black Edition wheels comes in at 11 lbs lighter, 3818 lbs. This would be dry of fuel, and possibly all fluids. 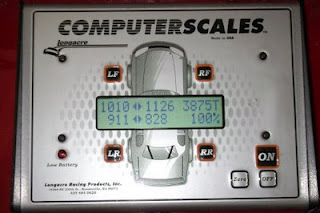 One more GT-R on the scales, this time a 2009. 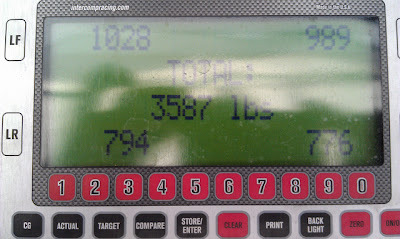 3875lbs. The car is a Premium with Ipod jack, floor mats and 3/4 of a tank of fuel. Notice the difference in corner weights between the 2012 and 2009. We can't read too much into the numbers, but it looks like the 2012 is a little better balanced than the 2009. I would have to see a few more sets of numbers to really see if we notice a real trend.